Being the champion of details, Arne Jacobsen mastered every little piece in his numerous projects. From large complex constructions to the interior, the furniture and the clocks that decorate the buildings as the perfect finishing touch. Arne Jacobsen designed the clocks on his buildings: Arhus Town Hall, Rødovre City Hall and the Danish National Bank. For Lauritz Knudsen he designed the Station wall clock in the 1930’s. For many years, wall clocks have been something that many associate with the clocks in a classroom and something that belongs to the past. But today the wall clock is a useful and decorative object to have in the home, which most often supports the home style and choice of decor. 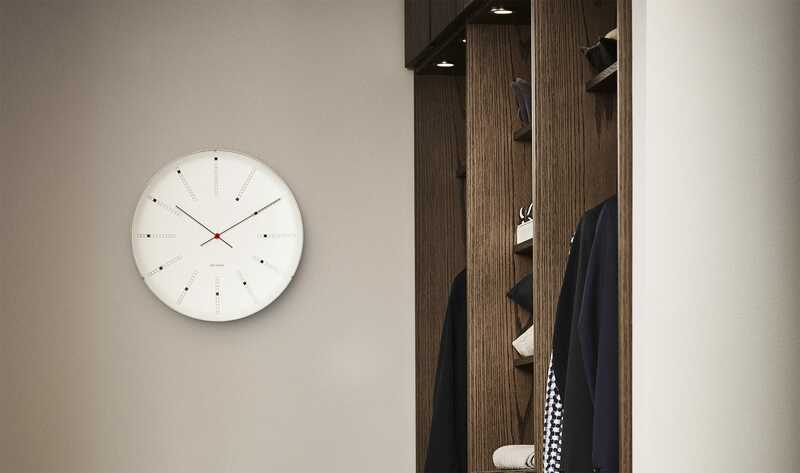 No matter what clock from Arne Jacobsen you choose, you get a classic clock in a nice design, which gives ample opportunity to put a personal touch on the space in which it is located. A wall clock radiates calm and style security - and then it shows the time and can help control your daytime rhythm. In principle, wall clocks can be hung in any room, but many choose to have them in the kitchen and in the office, for example. It can be to keep track of the time in cooking or when the next coffee break is. The wall clocks are, however, to a great extent also moved into the living rooms and most often form the frame for the interior style and spread the peace over the family. The wall clock has a central place in the home, and with a classic design you never get tired of looking at it. Bankers wall clock is designed by Arne Jacobsen and is a good example of his uncompromising approach to the design. Arne Jacobsen created total concepts, where the red thread treaded everything from the building to the furniture and interior. Use the wall clock as a starting point for your own red thread in the home. The wall clock, which was originally designed for Danmarks Nationalbank (and which actually still hangs in the entrance), comes in several sizes and shows the time in its very own, unique way. On this page you can get an overview of the different wall clocks designed by the legendary Danish designer, Arne Jacobsen, over the years. Your next home clock can be one of these great looking and unique wall clocks. Arne Jacobsen's wall clocks are available in four different designs; Bankers, Roman, City Hall and Station are available in several sizes: Ø16 cm, Ø21 cm, Ø29 cm and Ø48 cm. All the watches are produced from Arne Jacobsen's original designs, which he has created in connection with various projects that span a long, incredibly productive and artistic completely unique career as an architect and designer. Although today we are constantly reminded of the time on all appliances in the home, there is something cozy and gradually a bit nostalgic about having a wall clock. The station clock was originally designed by Arne Jacobsen in collaboration with Lauritz Knudsen, who sought a universal watch design. The wall clock comes in four sizes, which together look like a small work of art on the wall, but which can easily stand alone. Give a wall clock to someone you care about, or to someone who tends to always be five minutes late. If you have any questions or wishes, please do not hesitate to let us know. You can contact our customer service Monday to Friday between 10am and 2pm. You can also reach out on Facebook, and we will get back to you as soon as possible.